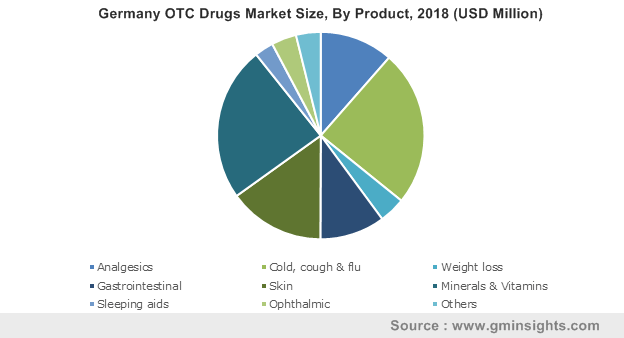 OTC Drugs Market size exceeded USD 125 Billion in 2018 and is forecast to grow with over 5.5% CAGR from 2019 to 2025. Over-the-Counter Drugs Market is poised to witness lucrative growth over the forecast timeframe. Major industry trends such as Rx to OTC switch by pharmaceutical manufacturers, growing tendency of people towards self-medication in developing regions and cost saving advantage to citizens in regions of Asia Pacific and Latin America are strongly driving the regional as well as global market. The increasing patent expiration rates is resulting in switching from Rx to OTC by the companies as a counter strategy. As per Consumer Healthcare Products Association, in the U.S., approximately 106 ingredients, dosage strengths, indications have undergone switch from Rx to OTC status, translating to approximately 700 OTC products in the market. The economic benefits received from OTC drugs usage is attributable to savings on drug cost and cost incurred on clinical visit; as healthcare provider visits are required to obtain prescription for Rx treatments. This factor significantly attributes to industry growth in emerging economies. 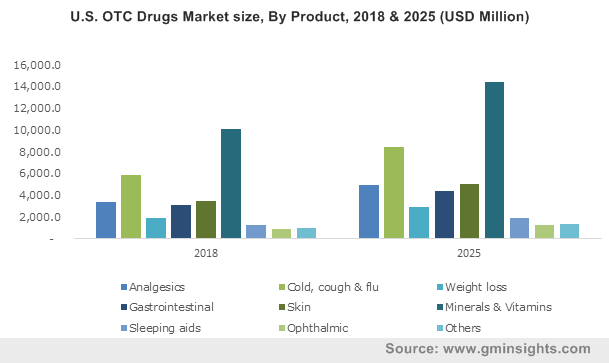 Despite of many advantages of OTC medications, several concerns pertaining to incorrect diagnosis and substance abuse vehemently hinders market growth. Many OTC recreational over-the-counter drug and some therapeutic drugs have been withdrawn from the market over the years. During the forecast period, more drugs are likely to be pulled out from OTC portfolio. 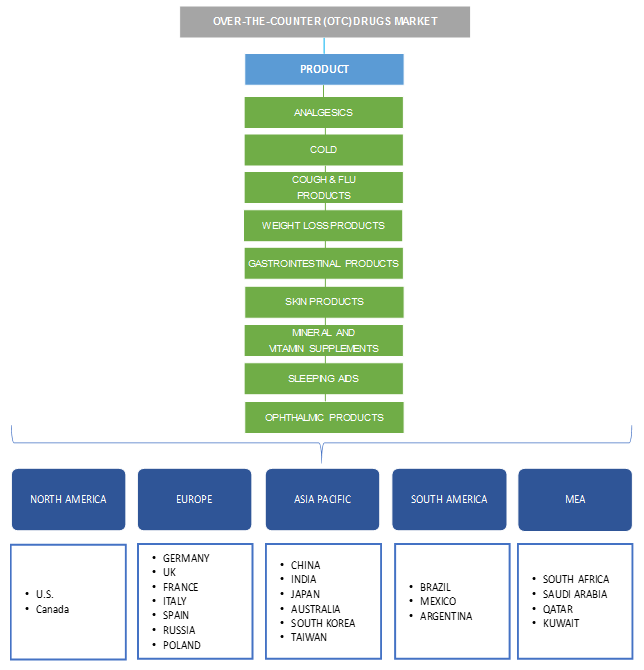 Globally, minerals, vitamins and supplement product category dominated the market in 2018 by accounting for over 28.5% market share, owing to their profuse use in developed nations such as United States, Germany, Japan, etc. Consumption of various vitamins and supplements is most likely to continue at similar rates in industrialized countries, driving the market growth. Lifestyle related OTC drugs such as weight loss products and sleeping aid are in great demand in developed regions. During the projection years, weight loss product category is forecast to witness 5.9% CAGR because of rising obesity rates in many countries across the globe. The demand for cold, cough and flu OTC drugs will experience the classical seasonal trend, driving a steady growth over the forecast timeframe. Ever increasing number of products in this category should continue augmenting industry growth in coming 5-7 years. Analgesics is one of the most popular OTC medication groups worldwide; thus, holds a significant market share. However, factors such as uncontrolled use and drug abuse leading to increased deaths and insufficient regulatory guidelines are likely to hamper the business growth. OTC drugs regional market is highly concentrated in handful major economies of the world. Together, U.S., China and Japan accounted for nearly 50% of the industry share in 2018. During the forecast period, U.S and Japan market will experience modest growth, owing to market saturation in some product category. However, technologically better products should boost business growth. Growing consumer appetite for self-medication and alarming need to curb the healthcare cost will drive the European over the counter drugs market over forecast timeframe to reach over USD 45 billion by 2025. However, lack reimbursement may discourage people to use OTC drugs rendering negative influence on market growth. During the projection years, German over-the-counter drugs market will be strongly driven by increasing efforts to licensing of OTC medicines for treating chronic conditions coupled with increasing willingness to invest in self-medication and measures to improve health, wellbeing and fitness. Over the counter drugs market in China is second biggest in the world accounting for over 20% of global over-the-counter drugs market. Availability of various OTC drugs in community pharmacies contributes largely to country’s market value. During forecast period, growth will be driven by needs of expanding geriatric population base and introduction on new products into market. However, inclination towards use of traditional medications should hamper industry growth. Prominent industry participants include companies such as Bayer, Sanofi, Pfizer, Johnson & Johnson, GloxoSmithKline, Takeda, Dr. Reddy’s Laboratories, Cipla and many others. Merger and acquisition is most practiced strategy across the industry. To gain competitive advantage, companies acquire each other’s OTC business division. In recent times, competitive landscape has witness major changes in top 10 companies ranking. Merck’s customer care acquisition has scooted off Bayer to leading position; similarly, many other companies have gained market share recently. Introduction of new products and geographical expansion are some other strategies adopted by these firms to expand their foothold. 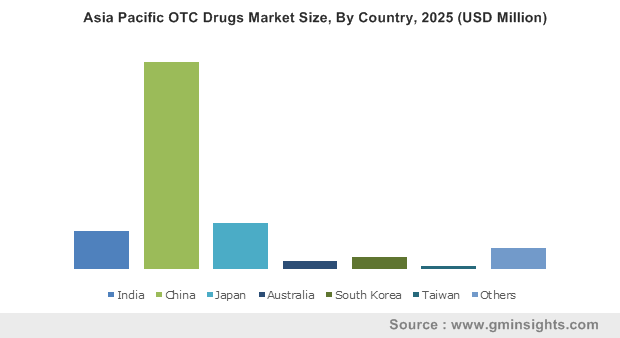 OTC drugs industry is highly fragmented across geographies owing to presence of numerous local and international companies. It is one of the oldest business segments in pharmaceutical industry that has evolved profusely over past few decades. Ever increasing number of industry participants and OTC products has been resulting in industry expansion around the globe. In recent times, shift of Rx drugs to OTC category has further augmented industry growth and will continue to influence growth in near future. Regulations pertaining to OTC drugs have played a major role in shaping up the present thriving industry and should favor during the forecast period.